Last weekend saw the 5th birthday of one of my favourite little people, my friend's son Albert. I'm not even going to go into how he can possibly be turning five already when I remember him being just a bump so clearly, because that will just make me feel even older! Wiss said he wanted to go as Batman so I duly whipped up an old-school Batman costume (mainly so I could get him to wear leggings with pants over the top!). He must have known any photos of him wearing said leggings/pants would only come back to haunt him because on the day he refused point blank to wear them. Or the cape. So in fact, my little Batman wore just the t-shirt with brown cords and his anorak instead. Damn him!!! I wanted to make Albert something for his birthday following the Super Hero theme and I came up with...Secret Albertman! Ssssssshhhhhh, it's a secret! All super heroes have an everyday alias, so I thought Albert should be able to become Albertman easily, you know, when the time is right. I cut two 'A's' from orange and black jersey, layered them with the black on top and sewed them both onto a black t-shirt 10mm from the edge. I love the way jersey rolls itself up in time, and thought that gradually the 'A' would become a little more prominent, but still not too obvious. 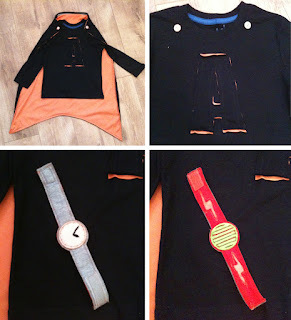 I made a cape from the same black and orange jersey fabric and sewed my first ever button holes at each top corner. The cape attaches to the t-shirt using fab orange striped buttons (from Ray-Stitch) so it can be worn or removed as the situation dictates!